North America Robot Sensor Market surpassed USD 680 million in 2017 and is expected to reach at over 11% CAGR from 2018 to 2024. Increasing adoption of robots across the manufacturing and logistics industry is proliferating the North America robot sensor market growth. For instance, according to the Robotic Industries Association (RIA), a significant number of robot shipments were recorded in the first quarter of 2018, propelling North America robot sensor market growth. In the first quarter, about 8,161 robots were shipped to this region valued at USD 437 million. Increasing adoption of automation by manufacturing companies in the U.S. has fueled the market demand for robots in the region. With the advent of new technologies, companies are implementing highly automated systems for a better production efficiency, thereby driving the robot sensor market. The cost of labor force in this region is relatively high as compared to the regions such as Asia Pacific and North America, among others. Constant increase in labor wages is leading to the high adoption of automation technologies driving the North America robot sensor market. 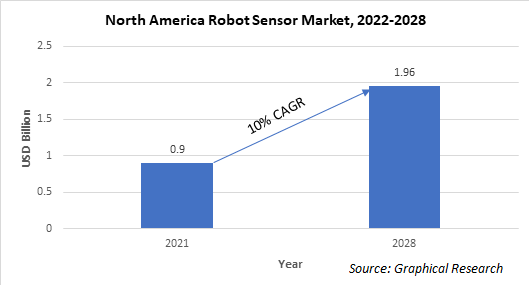 Several applications of robotics in non-automotive sectors such as food & beverages, life sciences, and logistics have augmented growth of the North America robot sensor market. The growing implementation of automation processes in these sectors has created a substantial demand in the North America robot sensors market. These initiatives also support the progress of low-cost robot systems to penetrate robotics in most applications. Growing number of initiatives by the government is another factor boosting the North America robot sensor market growth. Huge investments are being made by the government in research & development of new technological advancements. National Science Foundation (NSF) has invested USD 700,000 to USD 1 million in 21 smart services system projects. These initiatives also support partnerships and collaborations for the development of new technologies. National Robotics Initiative was formed in 2011 that aimed at increasing the development and use of robotics in several sectors. For instance, NSF researchers are trying to deploy robots in elderly care, which is expected to contribute the market in the coming years. Key industry players in the region are Emerson Electronics Company, Rockwell Automation, Honeywell International, Inc., and Texas Instruments, among others. They are expanding their businesses to establish their footprint in the North America robot sensor market. For instance, in August 2018, Texas Instruments planned to extend its manufacturing facility in Dallas, U.S. to increase its manufacturing capacity, which will further increase its market penetration. Additionally, huge investments are made in R&D by companies to deliver new technological solutions which are projected to improve the share of North America robot sensor market.